Strong storms may only take a few minutes to pass through, but the results remind us for days to come. While you’re cleaning up the yard, be sure to watch for blown off shingles or slate. If you want to take it a step further, use your ladder to get a closer look at the roof. Check for damage to the ends of the shingles or to the gutters. This is also a good time to check for loose or missing shingles. Inspect the caulk at the chimney flashing. You’re looking for dried out or cracked caulking. If climbing up to the roof isn’t what you’d like to do, call Showalter Roofing at 630-499-7700. We’ll check all of these points for you, take pictures so you can view the damage yourself and we’ll fix any damage caused by summer storms. If there’s one thing we can count on are high winds coming at our homes from all directions. What can we expect from high winds? Shingles become loose and the loose ones end up in the grass or our driveway. In our latest video, “Shingle Roof Repair on Windy Days” learn about the two shingle types: the standard 3 tab and the architectural shingle. Find out how the 3 tab shingle dries and curls allowing the wind to get under the tab and pull it away from the roofing system. Learn the benefits of an architectural shingle and how it adheres to the roof making it difficult for the shingle to pull away in high winds. As we visit many homes…and rooftops, we’ve identified many roofs with the CertainTeed shingle with organic felt that are defected. It usually occurs around years 10 to 15. 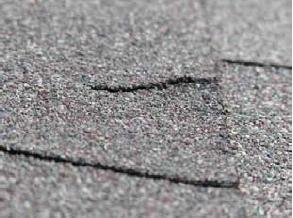 However, the warranty of the CertainTeed shingle is around 25 to 30 years. Fortunately, it is covered under warranty by CertainTeed. Being insured and bonded can make all the difference in the long run. When it comes to working on major projects around the house, the roofing system can be one of those projects that can cause many headaches if you don’t have the right team working on the project. It is highly recommended to make sure that the company or team of workers that are offering their services to perform work on major construction projects around your home is bonded, licensed, and insured. Often times, hiring someone that is not bonded or insured will be substantially cheaper and all the responsibility if something bad happens falls into the homeowners lap. Always remember that even though the price may be very appealing, you get what you pay for. Saving a few dollars up front ends up costing more in the long run. Here is a short story of a recent colleague that experienced the hardship of what it means to be bonded and insured. Owners of a recently purchased bed and breakfast outside the Milwaukee area, experienced heavy rainfall this past autumn and were exasperated to the amount of rain that found its way into the home. Reflecting back on the negotiations of the sale of the house, the previous owners were supposed to have fulfiller their obligations by installing a new roof to the establishment. The problem was that the previous owners contracted a roofing company that was uninsured and un-bonded. The party responsible for the poorly installed roof is now on the previous owner and not on the roofing company that did the work. This makes more headaches and problems for the new owners to be able to resolve the situation in order to continue to make money as a bed and breakfast establishment. It is very important that anyone you work with is licensed, bonded, and insured. Once you know that they are by researching and confirming that they are being truthful. It’s always a good idea to ask for referrals from a trusted neighbor, friend or co-worker. However, be sure they’re not a family friend, a guy that does side jobs or an unemployed worker trying to make ends meet. Showalter Roofing Services is a fully bonded and fully insured roofing company. We are committed to exceeding your expectations with the work we do and it shows before, during and after a project is complete. Our customers appreciate the work we deliver and reference us to their family and friends. We appreciate their kind words and continued business. Showalter Roofing wants you to refer us as well. Let’s begin a long-lasting relationship. 1. The Rooftop – This is the first line of defense when it comes to protecting the house and is considered the main component for keeping rainwater from entering the home. The construction of rooftops for best results should be pitched or sloped to direct water downwards and does not allow it to collect on the roof. Inspecting the entire rooftop for damaged shingles, cracks, and holes will assist in preventing further damage caused by heavy rain. 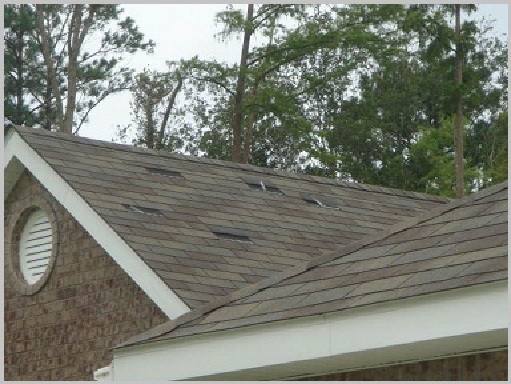 If you find that your rooftop has developed holes or small cracks that will allow water to leak through or if you feel your rooftop is not pitched or sloped appropriately, Showalter Roofing Services would be happy to come out, take a look at your roof, and provide the best solution to your rooftop so you can prevent damage caused by heavy rainfall. 2. Chimney – The construction of the chimney should be sealed tightly together with no revealing gaps. A chimney cap may be a consideration to install to help prevent water from coming in through the chimney. Finally, inspect the seals and flashing of where the chimney is attached to the roof. If there are signs of damage, get it replaced or repaired as soon as possible. Some brickwork becomes porous over time allowing moisture to actually be absorbed into the brick causing leaks. This is especially true during several consecutive days of rain. Masonry sealant will solve this problem provided the brick and mortar are in good condition. Remember, roof repairs can be dangerous, so if you have experienced damage to your roof during this fall rain and it is fairly severe, it is best to call in a professional roofing contractor such as Showalter Roofing Service to assess the damage and provide the necessary repairs.